Amazing team building time for your group while challenging yourselves through a variety of adventures both individually and as a group. 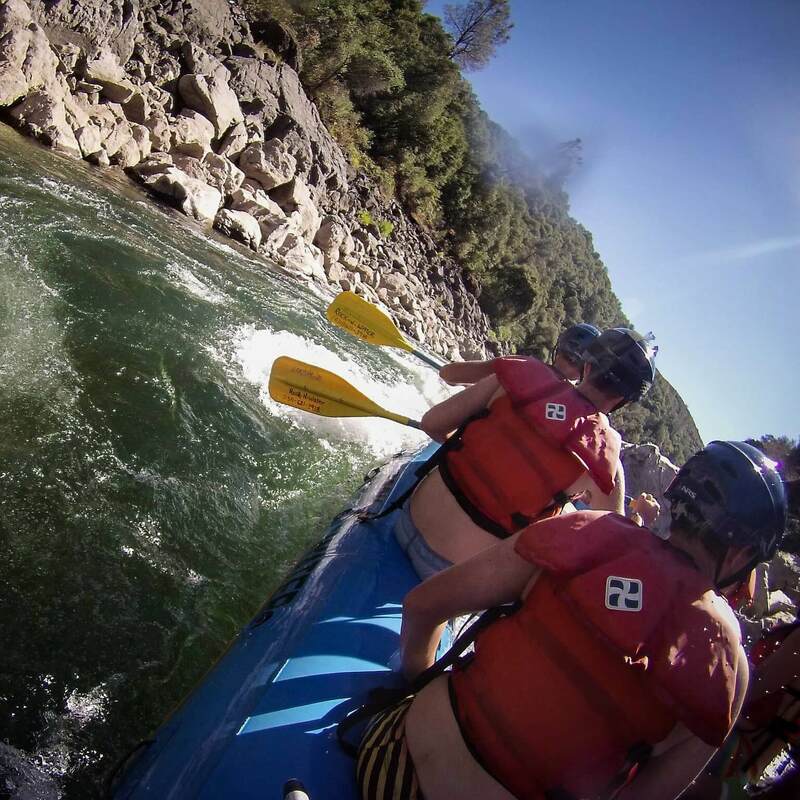 We’ll spend 1 day group/corporate team building activities, 1 day canyoneering, 1 day of Class III river rafting on the South Fork of the American River (or High School groups can bump it up to Class IV California rafting on the Ruck-A-Chuck for just an extra $32/person). Each day on our adventures, we’ll experience the beauty and strength of God’s creation. 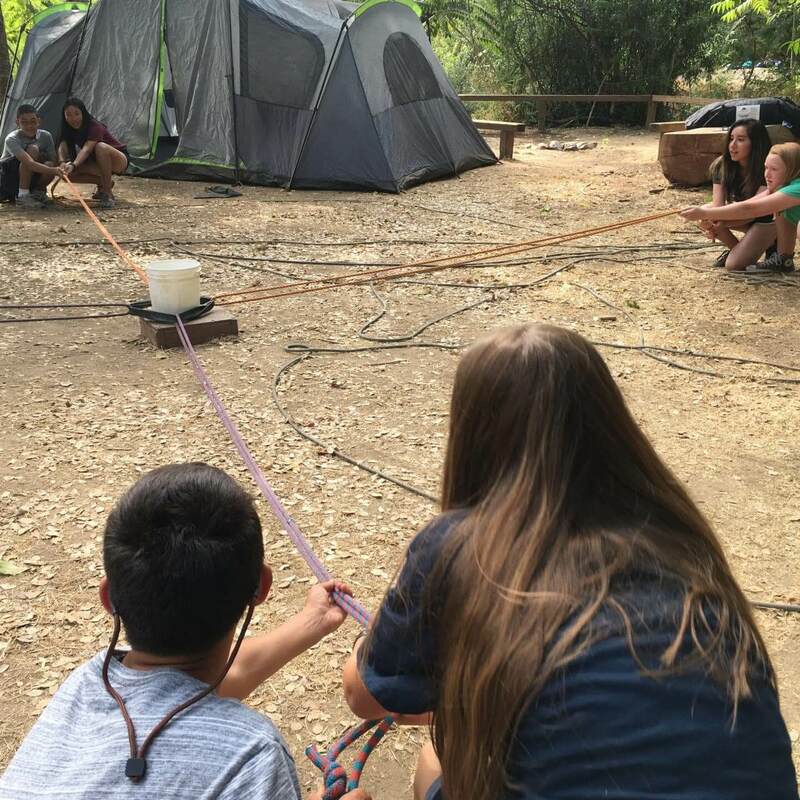 We’ll challenge ourselves physically, to grow in our Christian faith and build lasting teamwork skills. 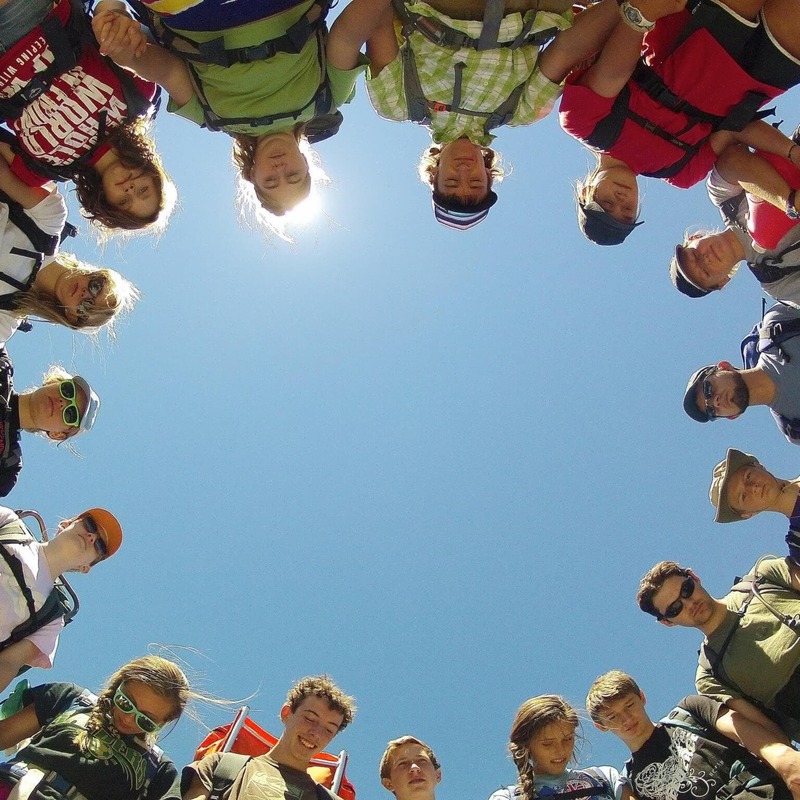 Among other things your group will take part in quiet times, campfires, climbing, exploring, rafting and team building challenges. Awesome camp in an awesome location. I would love to work as staff here some day. I had a great time during my first experience at Rock-N-Water Camp. 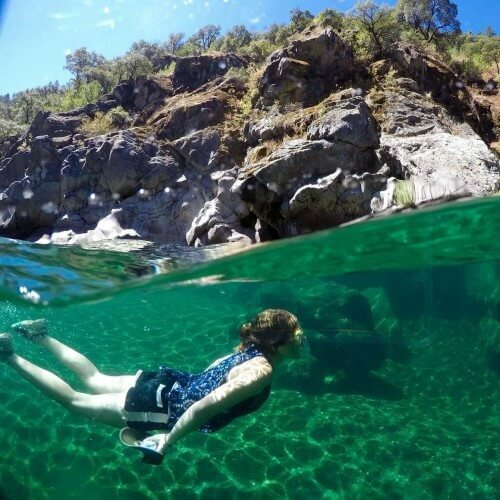 All the staff my group and I adventured with and encountered during our stay were very friendly, approachable, and knowledgeable with a great sense of humor! I always felt well guided and safe. Thanks for a memorable time! This was a great experience for myself and for my students. Positive. It was the right blend of R&W staff interaction with our students and school staff. The skits were fun. Great food. Some variation in the menu would be appreciated i.e. too many burritos 🙂 Activities well organized and appropriate for our group. Staff were very professional. Location was ideal with good free-time activities also. 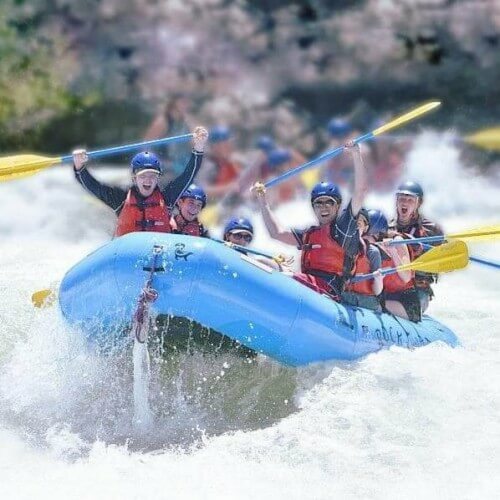 Our son loved the white water rafting and had fun! Thank you for making it a very memorable experience! My experience at Rock N Water was amazing. I loved how welcoming it was and how we were all pushed outside our comfort zone. I loved that we were able to sleep under the stars and all of the water activities. I would definitely recommend a friend to go to this amazing, adventurous trip. Thank you for the best time ever!! Great fun and guides. Rafting and hiking was a blast. I was really nervous about camp since a lot of things I have not done before and are outside my comfort zone. The staff at RocknWater did a really good job at making me feel comfortable, safe, and I was able to go at a pace that worked for me. They made sure that I was given all my meals and provided me with extra things I wanted to eat that were not on the menu. My experience ended up being a very good one thanks to the staff at Rocknwater. My experience was amazing because I got to socialize with friends and do amazing activities that I have never done before! I wish to go back soon! My experience was amazing. I became closer to other people, and I got to know the people in my group. I also would like to thank the guides who helped me and the others in my team, especially when we were canyoneering. Everyone there were super welcoming and for my first time outdoor camping, it was better than my expectations. All in all, Rock-n-Water was great physically, spiritually, and mentally. What an incredible trip! This is my second time going to Rock N Water for a three day camp with 140+ high school freshman. I am continually impressed with the Rock N Water staff. They all have a wealth of knowledge and experience and you always know you are in good hands. It’s incredible watching them work simultaneously with students who love white water rafting and those filled with trepidation. They are great at bringing students together, encouraging team work, and fostering student leadership. They truly embody what it means to live out the Gospel in every day life! 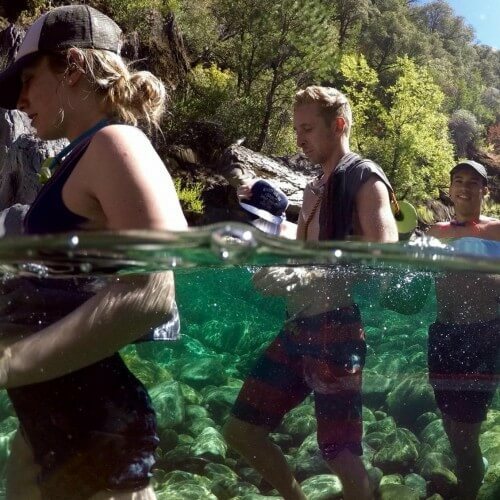 No matter what activity you do–rafting, team building, canyoneering, etc–you will have a wonderful time. I can’t wait to return next year! Yes, it is a great trip. I think the only reason for 4 instead of 5 stars was that 3 meals all used tortillas. While the food was good, it would be nice to mix it up a bit with the evening meals and breakfast. Also, tough to have Sun Butter for lunches on canyoneering and at team building. The guides were excellent, and the rafting and canyoneering were super fun. Well worth it for anyone looking for a good Christian Camp. I thought all the activities were really fun. It was a little too dusty/dry in camp, but I don’t really like camping anyway. It was fantastic and exciting! I would definitely go again! Thank you for your work in making this the best summer experience for me! My daughter did not want to go to Rock-N-Water, but she did, and when she got home, she missed it terribly and wished she could go back. Thank you for making her time memorable. She is not exactly the most athletic girl, but she did so well hiking, she was assigned to be a leader of her hiking group. Again, thank you! it was great. I had a really good time. the only issue was the food. we had burritos practically ever day and it kinda sucked. The activities were fun with friends. But, there was not enough tent space so had to sleep out in the open, which was very cold and we could not sleep very well each night. 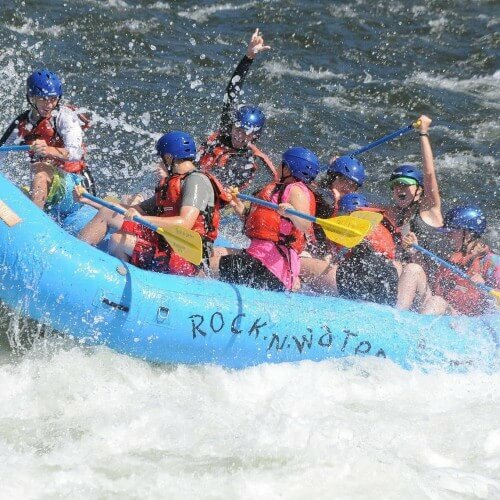 I really liked the white water rafting because our guide was really cool and nice to us. 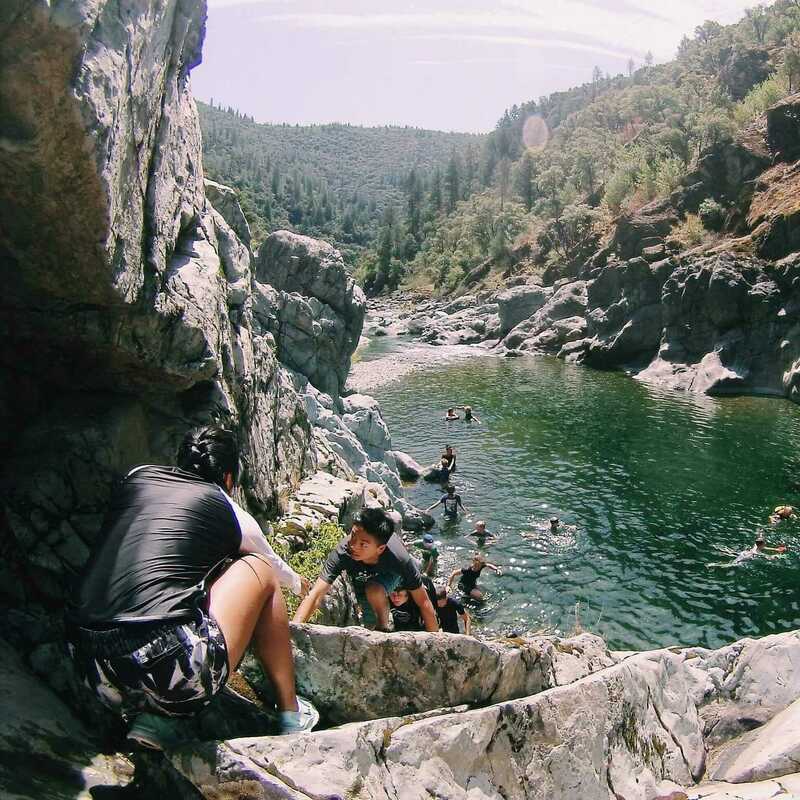 I also really liked the canyoneering because it was fun to climb up rocks and swim in the river. Our Freshmen had a great time, and we are looking forward to returning next year. 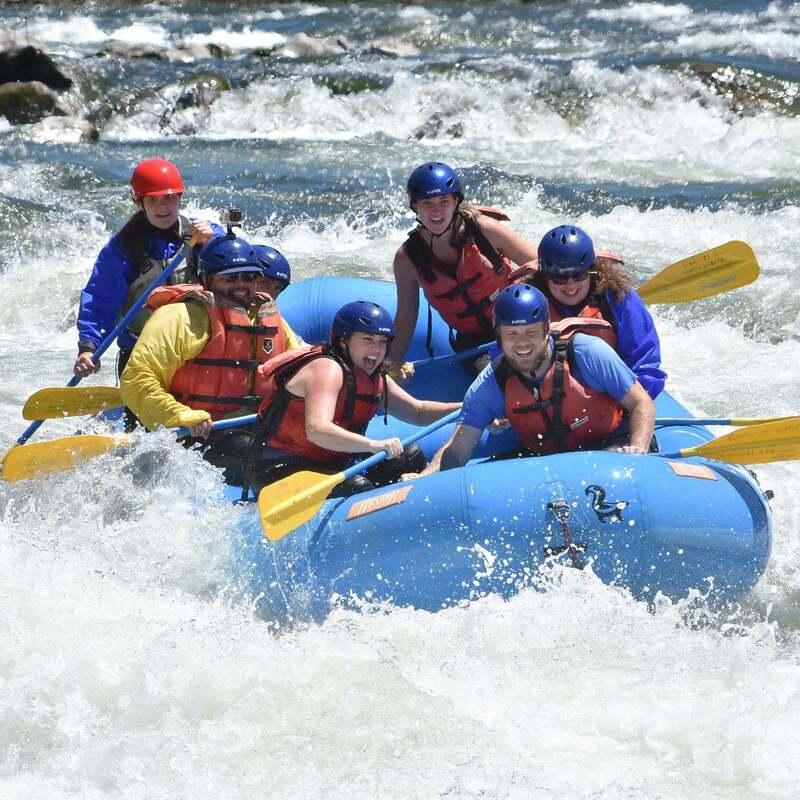 I felt God’s presence, power, and majesty in the River, and how are lives are so much like a rafting trip: some moments are peaceful and serene, others full of turmoil, but with a good guide, we can make it through to the end! I had such a terrific time! I am not an outdoorsy person by any stretch of the imagination but felt challenged but not overwhelmed. Students seemed to really enjoy it. Guides and everyone who worked at the camp were amazing. They were qualified, patient, and great at drawing the quieter students out of their shells. I cannot wait to return! Loved the activities! Never bored! I loved it! I had so much fun and I loved that it was Christ-centered. Such an amazing time with fantastic people! It was fantastic! It went way above my expectations and far surpassed what I thought the trip was going to be. A lot of that was the quality of the staff and guides on the trip, but the atmosphere and structure of the trip were also high quality as well. My son loved it. Shower situation was hard but otherwise it was good. Our time at Rock N Water was wonderful. I was impressed by the intentionality of the guides and other staff members who loved our students so well. They did a great job of interacting with our students and pointing them to prayer and our Lord, as well as helping them to see the importance of sitting and being in nature and in God’s creation. Thank you for serving us so well! I felt like the staff was completely engaged in our group and contributed to our amazing experience. I highly recommend this trip as a fantastic team building event as well as a life challenging and life changing event. Awesome team and awesome company!!! Friendly and qualified staff who worked well with our large group to accomplish our goals. 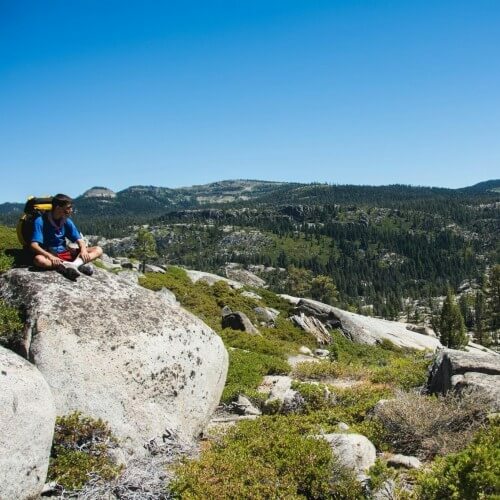 Great camp; great service; great outdoor experiences. Too repetitive on menus, though they were good quality. Loved the experience with the campgrounds, guides, and water rafting. Food and facilities were good too. 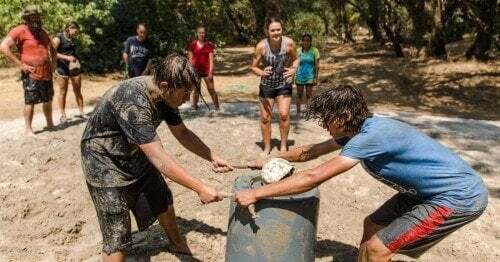 May ask for more challenging team building activities (ex: two posts with ropes interwoven randomly, goal is to bring each member across without touching the ropes, can only go through each hole twice max. ; team of 7, bring your team across a distance but can only have 3 feet touch the ground; …other ideas?) Not sure how much body contact is appropriate for our school, so the given ones we had were good this past week. Thanks! I was highly impressed with the quality of staff the was provided to us. With a group our size it would have been easy to have a mixture of quality but every single staff member I spoke with was outstanding. The staff made the trip for me. In the future I would love to see the rnw staff more involved in campfire time but completely understand that our group is something different that you typically do. Rock-n-Water was an amazing experience for me! Our guides were super awesome and helpful! I loved it! I went probably 7 or 8 years ago and I still talk about and remember how much fun I had at Rock n water. I actually fell out of the boat on the white water rafting adventure and my brothers and I still laugh about it. Keep doing what you guys are doing! Everyone loved the activities and the camp leaders – Stewart and Meghan. The food was yummy.It was awesome learning to trust more on God and others when facing difficult tasks. It was fantastic! The guides were so patient and were great with our group. All the kids in my group loved the camp, definitely hoping to come back! Coming into Rock N Water, you automatically feel welcome. The staff and leaders there are always so positive and uplifting and you can see Jesus shine through each and every one of them! I was really glad Rock n Water was so organized because I never felt like I had nothing to do, I was constantly moving. The activities there put me through lots of challenges, helping me grow to trust the Lord more through each one. Even with trusting the Lord through my whole trip, I also felt very safe and in good hands with the staff. Thank you Rock n Water for giving me so wonderful memories I will never forget, and I am definitely looking forward to come next year! 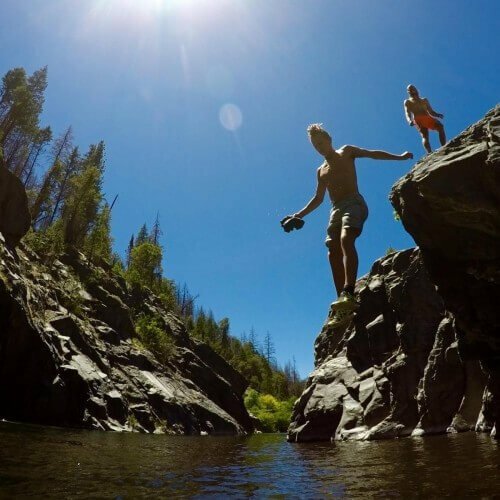 The experience I had at the camp was amazing, the guides were awesome and super friendly and canyoneering and white water rafting were so much fun. I felt that God really worked through the guides and the camp to connect to us.